With over 30 years of wedding performance experience, harpist Anne Roos offers links and resources that you can count on. The first section links to useful information in the greater Lake Tahoe area, the Sierra mountain range, foothills, and California Gold Country. National links follow. To find wedding service providers that follow ethical rules of conduct, contact members of the Tahoe Wedding Industry Group and Weddings of theWest. Anne is an active member in good standing in both of these wedding business associations. For wedding service providers from around the nation, and their reviews, visit WeddingWire.com and read reviews of Anne’s wedding performances on WeddingWire.com. Also visit Anne's profile on TheKnot.com for reviews and more. 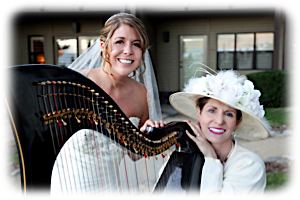 The best way to get a referral for a professional wedding vendor is to contact harpist Anne Roos directly at 530-541-2575. She is happy to offer referrals, because she sincerely wants all of your wedding services, including your harp music, to be perfect.